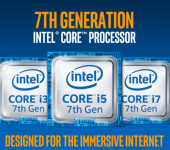 Kaby Lake is the codename for the evolution of Skylake architecture and is the seventh generation of Intel® i Core ™ processors. The new i7, i5 and i3 Kaby Lake processors have integrated the new Intel HD630 GPU, while the Skylake series processors have the HD530. As with processors, we compare GPU benchmark data. Improving graphics performance is definitely more interesting; we are around 20%. Kabylake processors are the first Intel® i Core ™ to be produced with the new PAO philosophy that replaces the Tick-Tock phases (term used by Intel to indicate its microprocessor development approach, through which the development cycle of CPU was divided into two successive “steps”). Starting in 2016, Intel® has introduced a new approach to the development of its microprocessors by introducing a third phase, and then passing to the philosophy Process, Architecture, Optimization (abbreviated in PAO). Kaby Lake architecture not only includes processors but also two chipsets, the Z270 and the H270. However, we will not find any traces of these products in industrial products because they are not part of Intel’s Embedded Policy and will therefore be hardly used by industrial manufacturers that need to ensure good product availability over time.